My Journey to Fit: 2018 Texas 10 Series Race Recap! 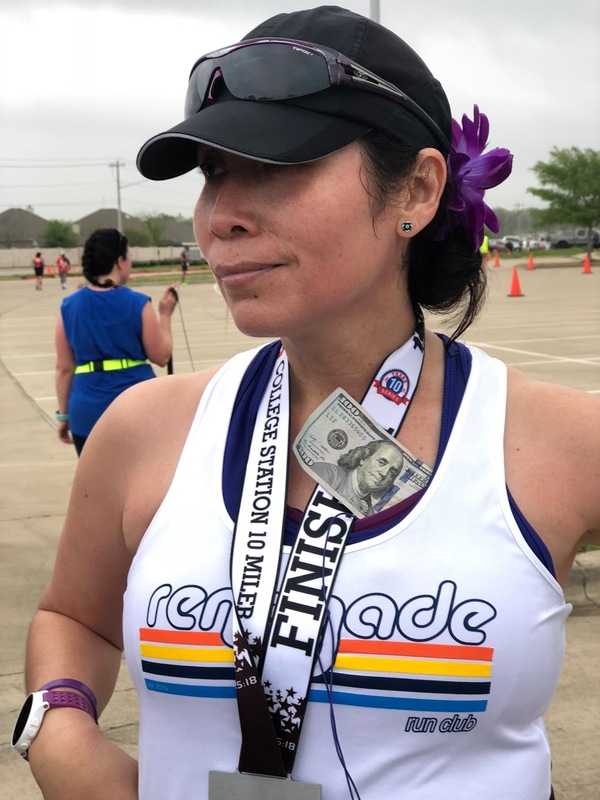 2018 Texas 10 Series Race Recap! 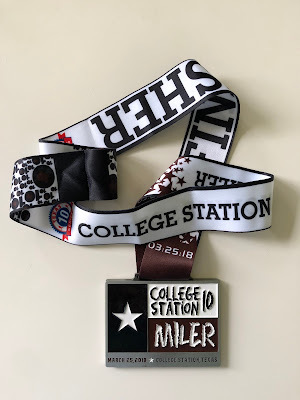 This year's medal, which is part of a race series. They had all of the other medals on display at packet pickup; they are all in the model of the Texas state flag, only in whatever color theme for each city. 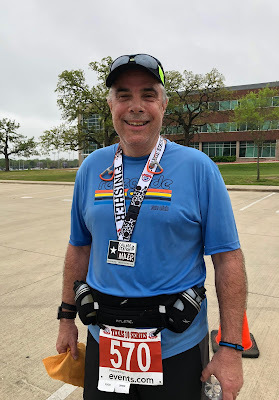 On Sunday, for the third year in a row, my fellow Renegades and I participated in the Texas 10 Series race, which had all kinds of distances - there used to be only a 10 miler and a 5 miler, but there was also a 5K and a kids 1K race as well, so there was a lot of activity happening. 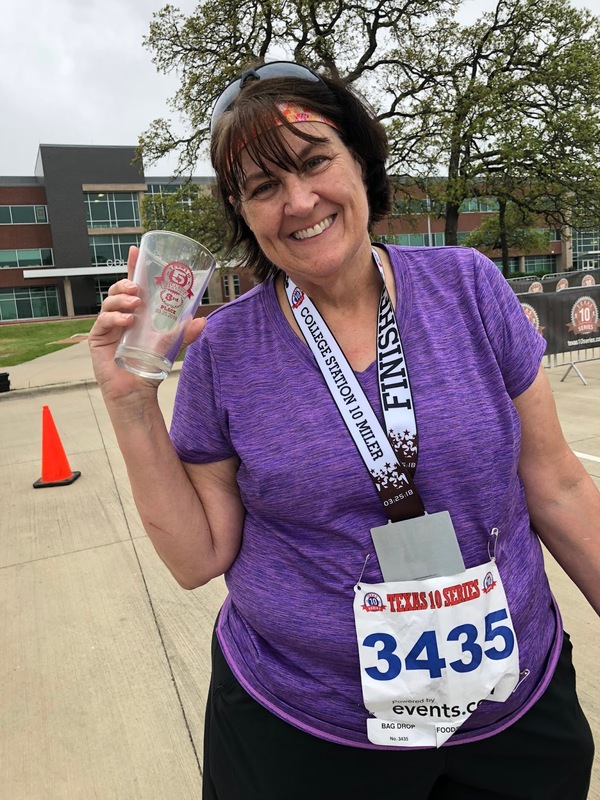 This race is right down the road at one of the local high schools, and it starts at 7:00 am, which is nice considering the last two years have been hot and humid - I appreciate that the race director knows Texas weather and schedules accordingly. 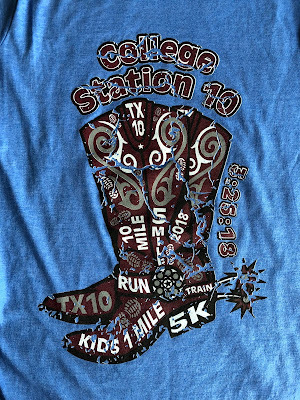 Race shirt - it wouldn't be a Texas 10 Series race shirt without it being several sizes too small. Meh - I didn't even try to exchange it this year, as there's too much printing on the front and I'm hot just looking at it. Straight to the donation pile with this one. I wasn't really nervous or anxious about the race, which hey - maybe running the route the week before actually helped? Any case, I'll take not wanting to vomit before a race any day. There were about 300 people running this race, so it was very casual at the start line. Funny thing - a few minutes before 7:00 am we lined up to begin, only to be told to go to the other side of the start line, which didn't make sense as that's not how the route goes. But we all strolled to the other side, the national anthem was sung, and then we were told to go back to the original side. Well OK then. So last year Diane, Cary, and I ran this race together when Cary was pregnant, and it was really sweet to run it together again this year, only this time we had Logan in the stroller with us! 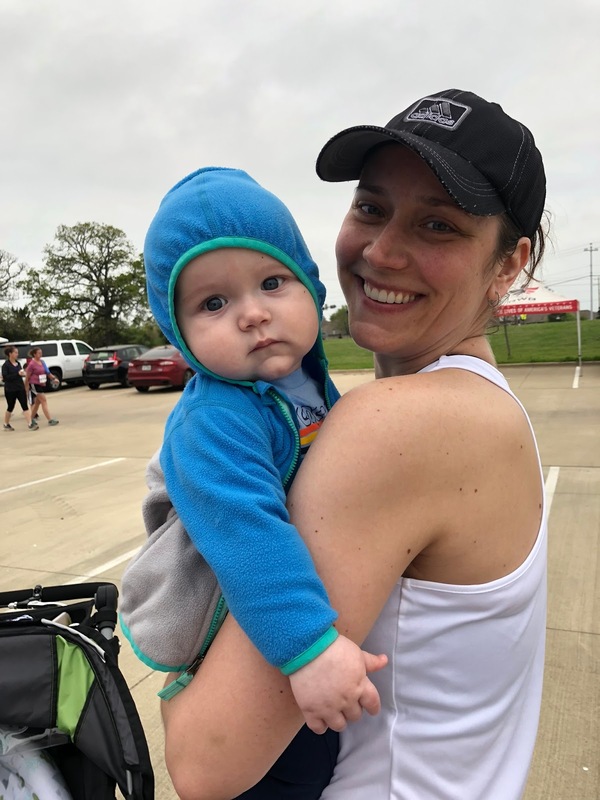 He napped during the first few miles but was awake toward the end - we could see his little feet kicking as we ran...soon he'll be running his own race at the rate he's growing! Photo courtesy of Karen, who had already finished. Shoe pic! Karen, Diane, Cary, Me...and Jimmymeow! Logan and his mama - so sweet! Now that he's run several races in the stroller, Logan is getting a taste for medals, and Diane willingly indulged him! It was nice that he had such a good race after the disaster that was Houston. 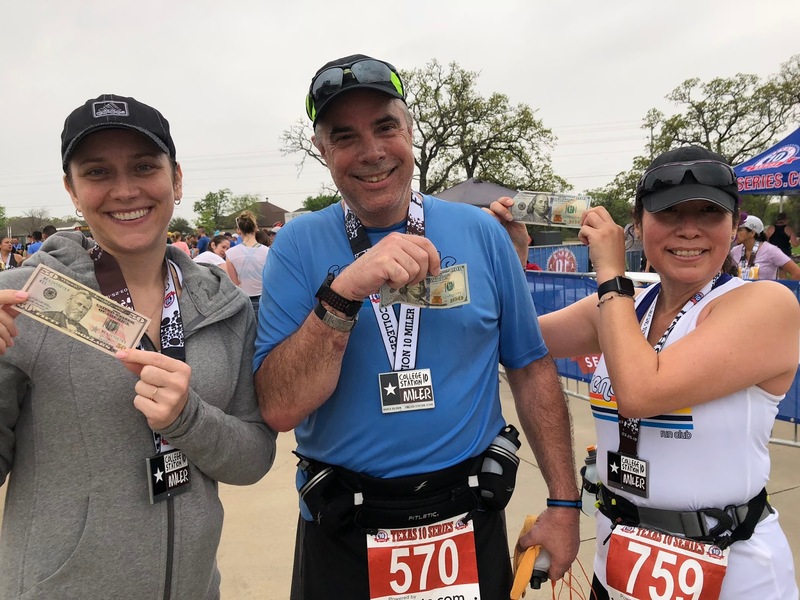 A fun part of the Texas 10 Series race is that not only do they do age group awards in 5 year increments, but they also give away cash during the awards ceremony. 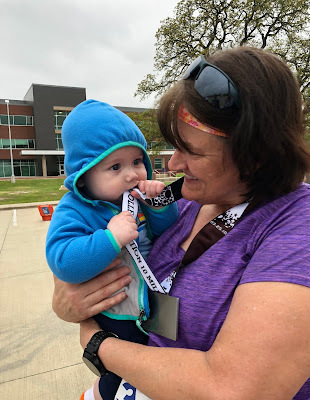 After you finish, you tear off the little number tag on your bib and drop it into the 5 or 10 miler bucket, and they draw numbers periodically while they are giving awards. 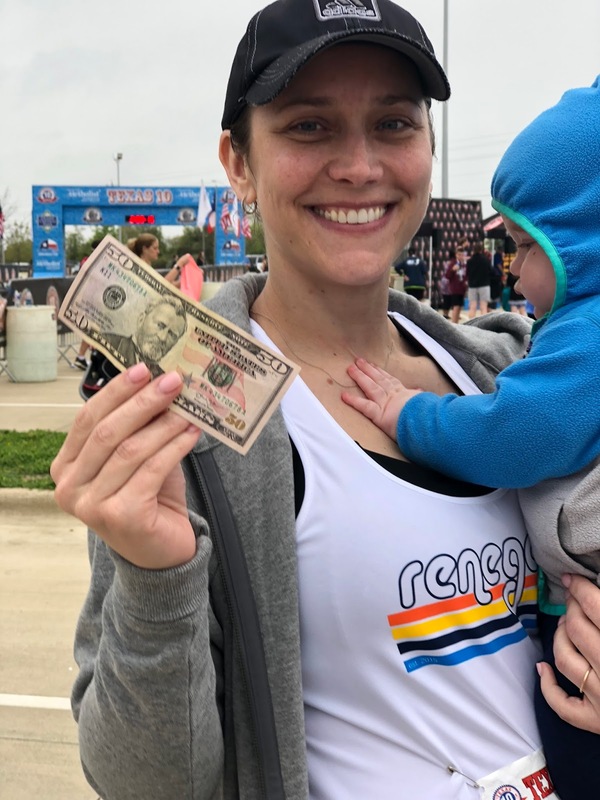 The 5 mile runners are eligible to win a $50 bill, and the 10 mile runners are eligible to win a $100 bill. Pretty sweet, right? Well, no one from our group has ever won, and I kept saying that we were due. Guess what? BOOM! Fifty dollar winner, right there! BOOM! One hundred dollar winner! BOOM! 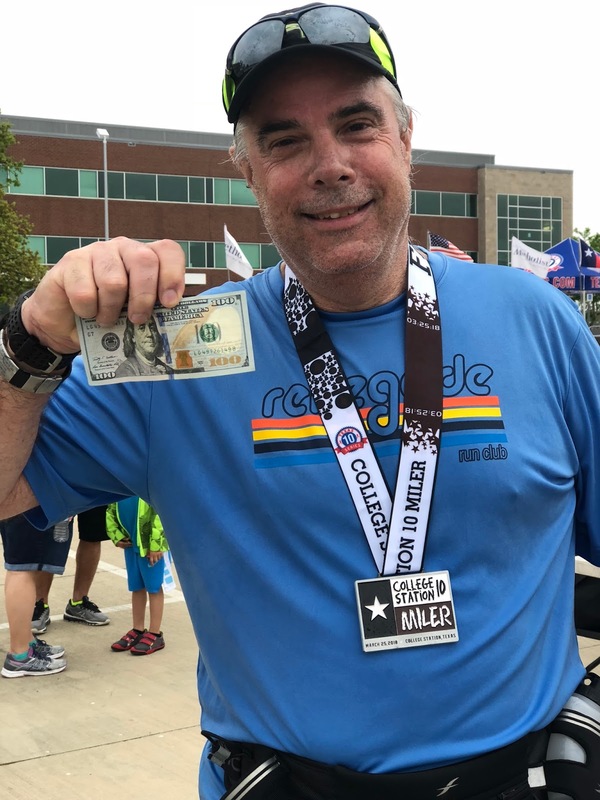 Another one hundred dollar winner! We were so excited and cheering like crazy - it was awesome to finally have some winners drawn from our group! Our Renegade winners - Cary, Jeff, and Julia! Considering we all registered during their first day bonanza event, we made out like bandits this year. I know that Jeff and I weren't even in the first pricing tier, but we only paid $20 for the 5 miler and $30 for the 10 miler, so winning $100 was really nice. Jeff is going to put that sweet cash toward a new pair of running shoes. Diane was the only one out of our group this year to win an AG award - third place, woohoo! But Jimmymeow couldn't resist squeezing him, and *blorp* there it was. No picture because I was too busy laughing at him. 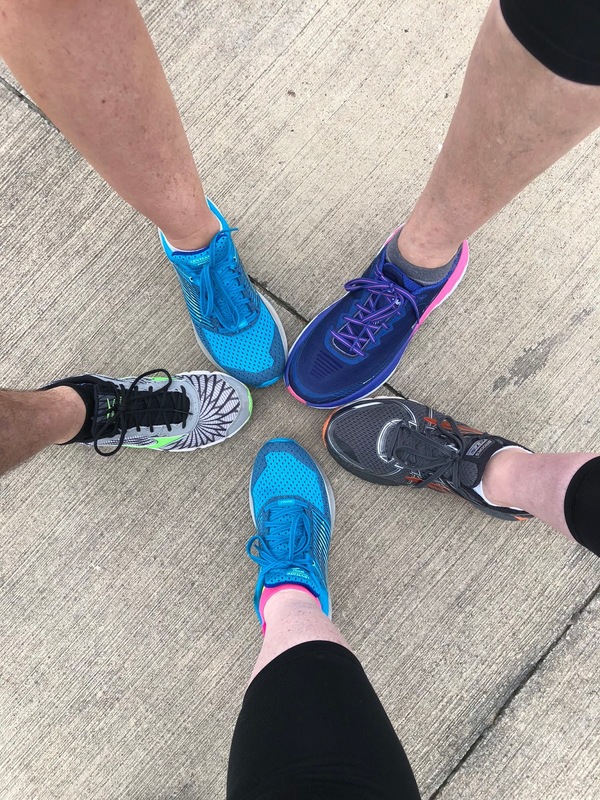 All in all it was a fun morning and a great way to spend time with my Renegade friends! What a fun race. Love your Renegades. Hey, I'm just glad Jeff won some money! Love it!!! I smiled the whole way through this post!!!! And I LOVE that you weren’t stressed before hand!!! 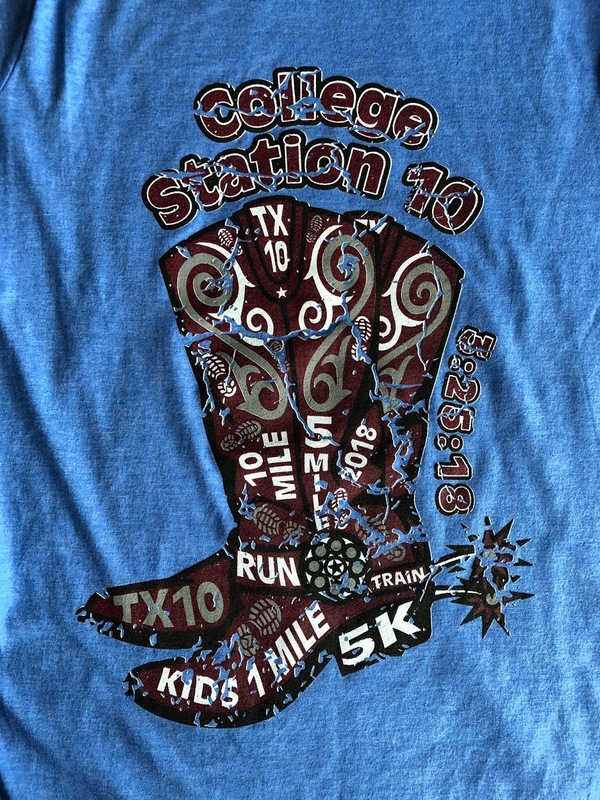 I think that race shirt is cute. Why oh why do they size them so wrong? You'd think race directors would get it by now. Nah, the money winners need to spend their bonus money on something fun! And the running shirt sizing - I don't get it. Year after year, with everyone trying to exchange for bigger sizes...you'd think they might get a clue? Sadly, that humidity is what we run in most of the year. Have you ever thought of making a t-shirt quilt with some of the shirts that don't fit or you don't like? That one would make a really cute quilt block! How fun that three of your group won the cash prizes!! 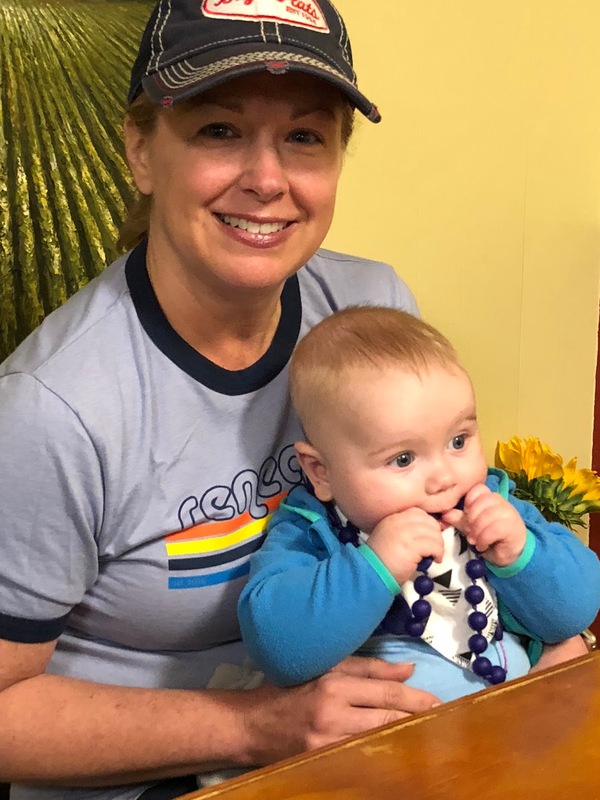 And the picture of Logan with his hand on his mom's cheek, and reaching for his dad with such delight on his face--priceless. You can tell he is a much loved baby! And, I'm glad that you enjoyed instead of dreading the race! 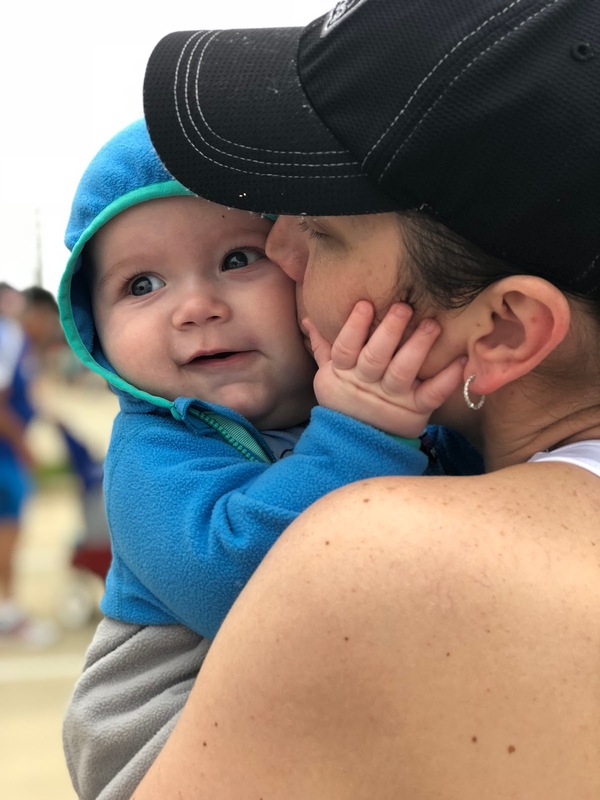 I agree, Logan with his hand on his mom's cheek is heart-melting. He definitely IS loved by many. Hah, you are so right! No on puked and we made money instead of spending more on things like an ER visit and extra night at a hotel. Go us! YASSSSSSSSSSSS to winning money and Mexican food after!!!! I am glad you weren't anxious or nervous, yay for smart planning! Oops, I forgot to say, having you guys move around on the start line is SO bizarro! Wth!!!! The fact that they sang the anthem with us on the wrong side makes me really wonder if anyone was paying attention. 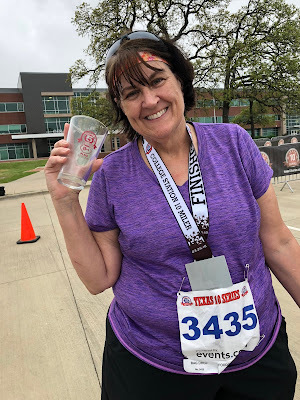 And I know I can't run every race route ahead of time, but this was a good thing to do for me this time. It definitely helped. Wow, so many winners here today! What a great race overall! 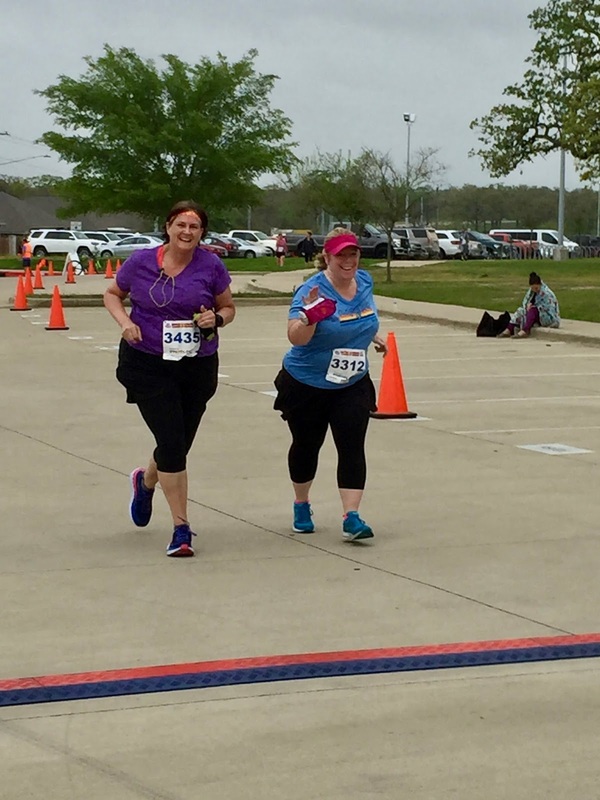 I love when a race offers multiple distances! Girl, you and me both on the blorping! Sweet with all the $$$ winning! Fun race day! But *blorp* is what got me. Haha! And Jimmymeow WAS warned! Erm, I think it's probably best that there are no pics. Glad I could make you laugh, Crissy! 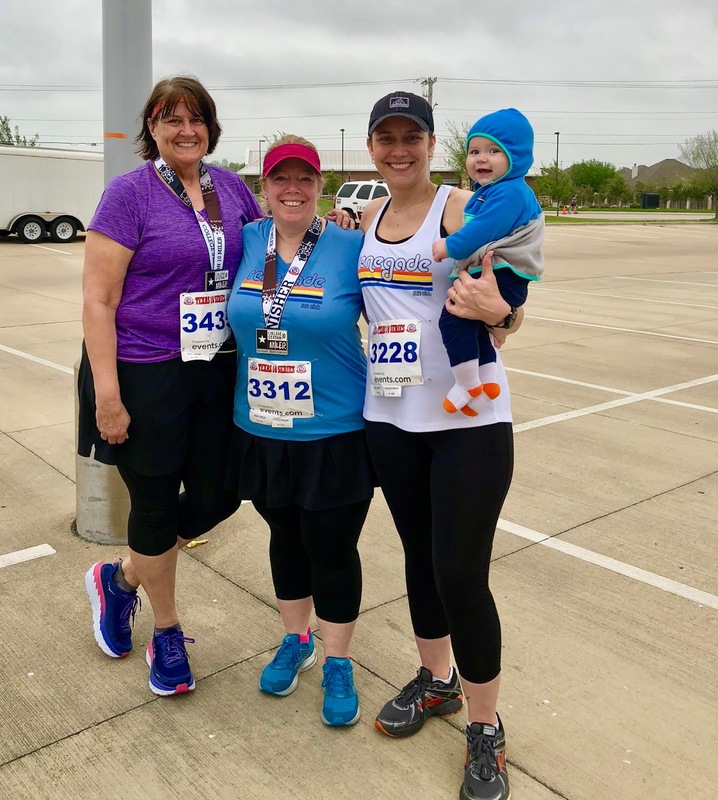 Another fun race with friends! Can I say, I sorta like the graphics on the T-shirt. LOL. 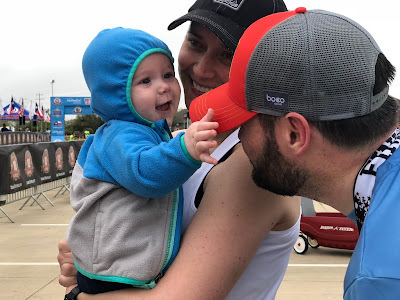 It's great you were able to play don't squeeze the baby after the race -- and that you weren't the grand prize winner.